Brighton, the largest and best-known seaside resort on the English Channel, stretches some five miles along the pebbled and sometimes steep chalk shoreline of the South Downs. Once a fishing village with narrow, winding lanes, the 18th-century saw Brighton blossom into an elegant vacation spot where England's elite relaxed in fashionable spas and hotels under the restorative influence of sea air. Reminders of this period still abound: charming Regency terraces; the delightful Palace Pier; and the Royal Pavilion, the exotic summer home of George IV, one of the country's most flamboyant and eccentric kings. Although Brighton's famous pebble beaches are now lined with souvenir shops and amusement arcades, it remains a culturally vibrant destination. The town's busy calendar of events includes the popular Brighton Festival each spring, horse races in the summer, and the famous London to Brighton Veteran Car Run in November. Brighton is also a great place for sports enthusiasts. Highlights include sailing, kite surfing, and diving, as well as hiking and biking along the downs or across the many lovely green spaces, such as historic Stanmer Park just to the north of town. The Royal Pavilion is difficult to miss. Located in the center of Brighton, just steps from the sea, the building's extraordinary peaks and spires look as if they'd be more at home in India. That was certainly the intention of architect John Nash, who designed the summer palace for the Prince of Wales (later George IV) in the Indian Mogul style. Best seen via guided tour, highlights of the building include the Banqueting Room, with its lovely oriental décor; the Royal Bedrooms; and the tent-like Music Room. Over in the former Royal Stables and Riding School is the Brighton Museum & Art Gallery, with its impressive collection of Art Deco pieces, a costume gallery with fashions from the 18th century, and the excellent Willett Collection of porcelain and ceramics. Also worthy of a visit is the Booth Museum of Natural History, notable for being home to one of Britain's largest collections of stuffed birds. Other highlights include a large collection of insects, fossils, and skeletons, along with the (in)famous "Merman," a Victorian-era hoax creature that many people at the time believed to be real. No trip to the seaside would be complete without a visit to a pier, with its amusement arcades, joke shops, and fish-and-chip stands. Thanks to its decorative ironwork and majestic setting, Brighton's Victorian-era Palace Pier is undoubtedly one of the country's most attractive such landmarks. Jutting out to sea like the upper deck of a steamer on spindly iron legs, Palace Pier is the sole survivor of the town's three original piers still in use (one was destroyed by a storm, while another stands derelict near the town's seafront). Built in 1891 and stretching some 1,700 feet from shore, it has lost none of its appeal. In addition to its dining and shopping, the pier also boasts other fun things to do, including state-of-the-art thrill rides and game arcades. A fun diversion is Volk's Electric Railway. Built in 1833 and the oldest operating electric railway in the world, this narrow gauge line runs along the seafront from the pier to Brighton Marina. Along the way, you'll pass the Brighton Fishing Museum, with its interesting exhibits relating to the town's origins and its long history as a fishing town. The center of the old fishing village of Brighthelmstone, as Brighton was once called, stood on the site of the bustling narrow alleyways known as The Lanes. The charming little 17th-century cottages, with their colorful wooden "weather boarded" façades are now antique shops, boutiques, galleries, and cafés. To the east of The Lanes is the Old Steine, a former village green. It is now a well-tended square extending to Grand Parade, a magnificent boulevard lined with trees and planted with flowers. Also worth visiting is North Laine, an arts-inspired shopping area boasting an eclectic mix of boutique shops and antique stores, galleries, and cafés, as well as entertainment venues. Undoubtedly one of the most impressive new attractions on England's south coast, the British Airways i360 observation tower is a must-do on any Brighton itinerary. Replacing the Brighton Wheel as the town's tallest structure (the wheel has since been dismantled), this 531-foot-tall seafront tower opened in 2016 to great fanfare as the world's first vertical cable car and tallest moving observation tower. Resembling a huge needle (and referred to as a "vertical pier"), the structure's circular observation platform can lift up to 200 people 453 feet for a spectacular view of the surrounding area and over the English Channel. Other features include a tearoom and gift shop. Strolling through Brighton's residential areas, with their lovely Regency-style terraces and squares, is a popular pastime. West of the town center, heading towards Hove, are street after street of old homes, with round bay windows and iron balconies. The best examples are at Regency Square, Brunswick Terrace, Brunswick Square, and the horseshoe-shaped Adelaide Crescent. Sussex Square, Lewes Crescent, and Arundel Terrace, all east of the town center, are also worth seeing. Another fine local example of historic architecture, Preston Manor is open to the public and perfectly captures life at the turn of the century. The annual three-week Brighton Festival runs from early to late May and attracts artists from around the world for performances ranging from orchestral and church concerts to jazz and comedy shows. Film screenings and recitals are also among the 400 or so events offered in this diversified festival (although the repertoire is varied, 19th-century music predominates). 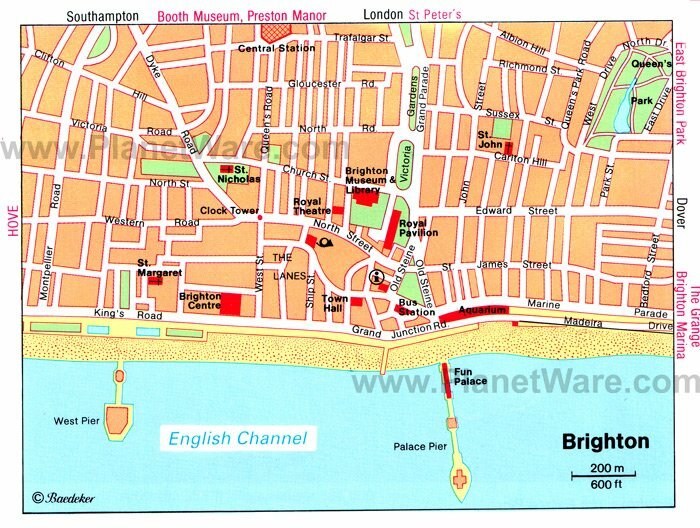 Venues include the Royal Pavilion, the Brighton Dome, the Theatre Royal, and local churches. Brighton Toy and Model Museum, underneath the town's train station, contains a vast array of vintage, rare, and unique toys from Britain and Europe, including trains by Hornby, bears by Steiff, cars by Corgi, and all sorts of dolls, toy soldiers, farmyards, circuses, planes, and puppets. Other collections of note include numerous toy buses, construction sets, boats, stuffed animals, zoos, and character play sets. Particularly fun is a unique train set featuring local tourist attractions. The museum shop and foyer is also home to a useful Visitor Information Point, offering maps and literature relating to local events in Brighton. Hot Tip: Try to plan your visit to coincide with one of the museum's special "Running Days," when you'll get to see much rarer toy trains in action. Just a few miles from Brighton, the Bluebell Railway is a fascinating piece of Britain's engineering heritage. Running some 11 miles along the border between East and West Sussex, this fully functional railway operates between Sheffield Park and East Grinstead. From here, you can catch a connecting train to London or Brighton. Famous as the first preserved steam passenger railway in the world to operate a public service, the railway's collection includes 30 vintage engines and almost 150 carriages and wagons, most of them pre-1939. Special themed train rides are offered, including fine dining, murder mystery nights, and Thomas the Tank Engine excursions for the kids. While not quite Wacky Races, the Royal Automobile Club's annual Veteran Car Run is probably the largest collection of unusual looking vehicles you're ever likely to see. The world's longest running motoring celebration has been held almost every November since 1927 and attracts entrants from around the globe eager to test their vintage vehicles on the historic 60-mile run from Hyde Park in London to Brighton's seafront. Some 500 pre-1905 cars attempt the trip, all of them a huge draw for the throngs of spectators and tourists who line the route to cheer these often slow-moving machines onward to the finish line. Set high up on the Sussex Downs, the stunning views of Brighton and the English Channel from Brighton Racecourse provide a unique background to the races held here throughout the spring, summer, and fall. It is regarded as one of the most intimate racecourses in the country (horses cross the line no more than a few feet from the crowd). Horseracing fans can enjoy a great day's outing here at one of the country's oldest courses (1783). Hotel Una: boutique luxury, Regency square, eclectic decor, uniquely styled rooms, breakfast in bed, massage room. Blanch House: mid-range boutique hotel, themed rooms, homemade cookies, comfortable beds. Artist Residence Brighton: affordable rates, sea views, creative decor, ping pong room, comfy beds. Premier Inn Brighton City Centre Hotel: budget hotel, great location, spacious family rooms.